Home » Politics & Public Affairs » Who are the Trudeau switchers? Who are the Trudeau switchers? Last week, we released a new national poll that showed the Liberals had gained three points in three weeks and six points since February and were now tied with the NDP for 2nd. The Conservative Party had 33% among decided voters followed by the NDP and Liberal Party at 27%. This is the highest we have had the Liberals in our regular tracking since March 2011. The Liberals have clearly benefited from the leadership race in our polling. A number of other polls were released last week that found a mixed bag of results. Nanos found that the Liberals had taken the lead (LPC 35%, CPC 31%, NDP 24%). Ekos’ likely voter model showed similar results to our poll (CPC 34%, NDP 26%, LPC 26%). Ipsos Reid found that Liberal support had grown to put them into a tied with the Tories (LPC 32%, CPC 31%, NDP 27%). It’s clear that in all polling done in the past two weeks – the Liberal vote is up, the Tories are steady, and the NDP is down. 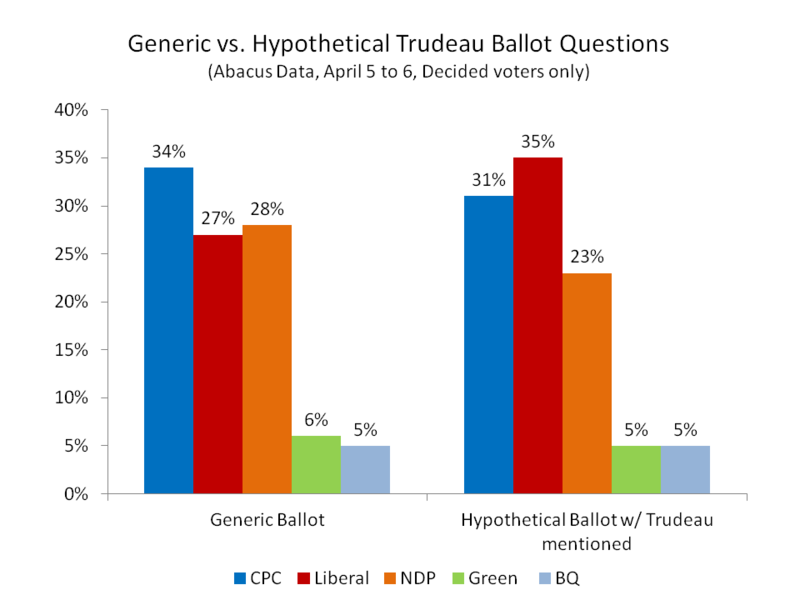 Like all the polls referenced above, our poll used a generic ballot question and Trudeau’s name nor the leadership race was mentioned before respondents were asked the question. But, what happens when you ask the hypothetical question – if Trudeau was Liberal leader, how would you vote? Well we did, but didn’t release the results last week. Although there are some methodological problems with hypothetical questions, especially so close to the Liberal leader announcement, the results of that question can tell us something about those voters who are willing to switch their ballot support after the mere mention of Mr. Trudeau’s name. Below I take a quick look at those 113 respondents in our survey who said they wouldn’t vote Liberal in the generic question but than change their preference only a few questions later. But first, let’s compare the results of the two questions. Methodological note – I am going to compare the result of the first generic vote question that does not include those who say they are leaning towards one party. As a result, the ballot results are different than the poll we released. When a respondent says they are undecided on the first question, we follow up with a second question asking if they are leaning towards voting for a party. To produce the vote intention results, we combine the two groups together (decideds and leaners we call them). The first thing to notice is that the Liberal number jumps eight points when we mention Trudeau as Liberal leader from 27% to 35% among decided voters. Conservative support dips three points while the NDP is effected the most losing five points. This “hypothetical” ballot result looks very similar to the results reported by Nanos Research last. 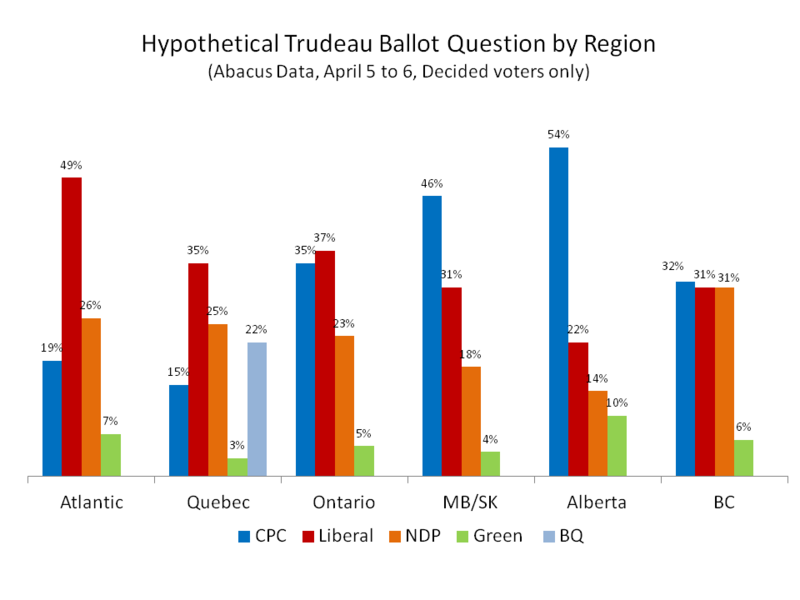 So it seems that at least in the short term, Trudeau has given the Liberals a boast in the generic ballot measure and as a result of the hypothetical question will likely give the Liberals a bump after his win yesterday. Now back to the original question I posed at the start of this post. Who are the 113 respondents who were voting Liberal in the first question but then switched after we mentioned Trudeau’s name. It’s a small sample but its profile might give us some insight into what voters will likely swayed and attracted by Trudeau’s leadership – at least early on. Let’s do this question and answer style. 1. Before switching to the Liberals, which party were the Trudeau switchers going to vote for? Takeaway: The plurality of Trudeau switchers are coming from the NDP, but one in four are former Conservative supporters. Trudeau is a big threat to Mulcair but he can also eat into Tory and Green Party support. 2. Trudeau switchers must all be women right? Not at all. In fact, 49% of the 113 Trudeau switchers in our sample were male and 51% were female. While Trudeau’s appeal is stronger with women, many men also have a positive impression of the new Liberal leader. 3. Are most of the Trudeau switchers young, and therefore won’t likely vote? Once again, our small sample of Trudeau switchers surprises. The age distribution of the sample is fairly similar to the overall age distribution of the population. Trudeau switchers are more likely to be aged 45 and older. A while back, I argued Trudeau has the potential to be the first Canadian Millennials candidate. Right now, his appeal is just as strong with older Canadians. 4. Where do most Trudeau switchers live? These results align more closely with conventional wisdom. Most Trudeau switchers, in fact the majority in our sample, live in Ontario. Another big group is in Quebec with the rest scattered across the country. 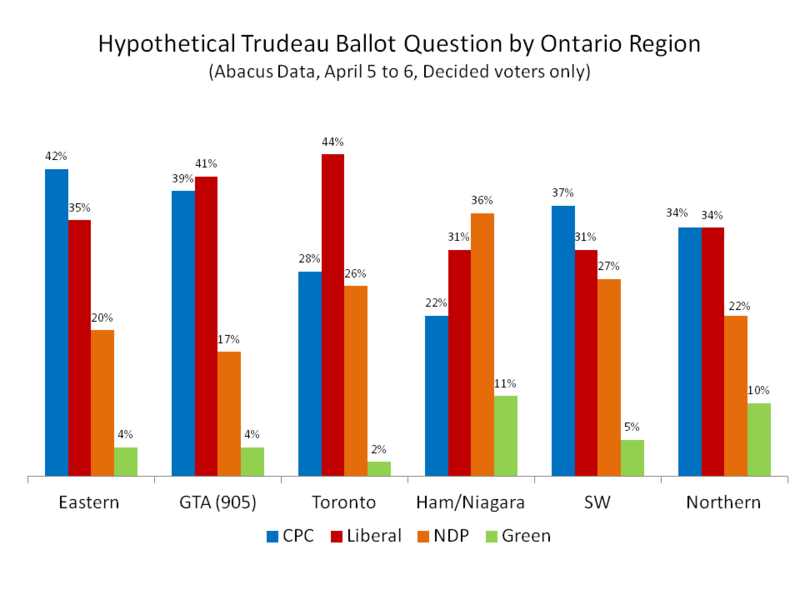 The small sample size means we cannot make firm conclusions but if this sample is any indication, Trudeau’s greatest appeal will be in Ontario, especially in the Greater Toronto Area (905 area code). 5. All Trudeau switchers must be Harper-haters right? Not completely accurate. Yes, a majority disapprove of the job performance of the Harper Government (61%). But among Trudeau switchers, 19% approve of Harper Government while 21% neither approve nor disapprove. So if this small sample of Trudeau switchers is a reflection of the voters who would consider voting Liberal because of Justin Trudeau, then the results spell trouble for both Tom Mulcair and Stephen Harper. More switchers would come from NDP ranks but Trudeau also appeals to those living in the Greater Toronto Area – a region that was critical to the Conservative Majority win in 2011. Reduce vote splitting in the GTA while attracting NDP supporters in Quebec, Atlantic Canada and BC is a recipe for Liberal resurgence. What do Trudeau Switchers think of Justin Trudeau? As you can expect, they really like the guy. These results DO NOT mean that Justin WILL become Prime Minister. But they highlight the voters that the Liberals need to listen to, engage with, and attract if they are going to win in 2015.